I collect antiques and back when I taught school I brought my lunch in a metal Lone Ranger lunch box (which wasn't seen by the students). I'll never forget the principal I had who pretended to be acting like a jealous child absolutely coveting that lunch box. We are still good friends and the act was all in good fun but some of the younger teachers thought I was in trouble. 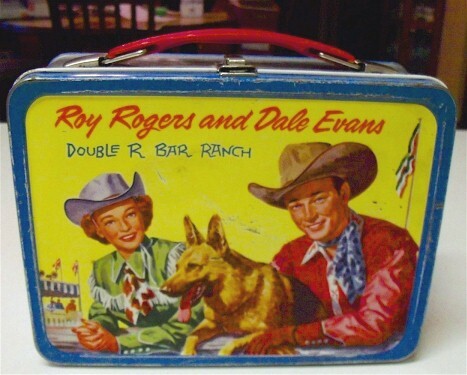 I had lunch boxes from two of Irwin Allen's shows. "Lost in Space", and "Land of the Giants". I don't recall carrying those colourful (Canadian spelling...I'm Canadian ) lunch boxes, however...somebody mentioned jelly and cream cheese sandwiches? Flashback. I haven't thought of those for YEARS. Right back to therapy. Wow - just looked at this picture and suddenly had a flashback to a peanut butter sandwich in a baggie - that must have been 40 years ago.. The trouble with these were....your particular box was "old news" by the end of the year and a new one was needed next year...the latest movie or tv show was "cool" but cancelled shows on your box gave you a nerd status.Also...you were almost tagged by your lunch box as to who and what you were!...and if you cut off your crust...ate your sandwich like a piece of watermelon...or had jelly and creamcheese...stay in during recess. I had a couple of these. Space, superman, lone ranger.